An insidious evil is starting to spread. Evil had always existed in The Nine Kingdoms, but this was different, impossible to identify, and relentlessly eroding the magical protections. King Adhemar of Neroche was attacked. However, the inability to identify not only who sent the beasts, but what they were was not the only concern. Instead, Adhemar had lost his powers. As had the Sword of Neroche. Now, King Adhemar would go in disguise searching the Nine Kingdoms in an attempt to find a sword wielder for the last remaining magical sword - The Sword of Angesand. His brothers would remain to protect the kingdom, including his youngest, Miach, the archmage of Neroche. Miach might get exasperated with Adhemar, in fact with all his brothers, but he cared for them, and they all took their responsibilities to the protection of the kingdom seriously. After Adhemar is absent for quite some time, Miach decides to leave Tor Neroche in search of his brother, and the sword wielder. Morgan of Melksham was on a quest to deliver a dagger to the King of Neroche. She would not have undertaken this quest, except that the man who asked was a man she loved almost as a father. A mercenary at heart, Morgan soon finds herself joined by others she had worked with, along with some tagalongs. One was Adhemar, who was quite annoying and a bit of a braggart. Morgan is quite upset with herself for being so charitable, it was unlike her. It is when Adhemar's brother arrives that Morgan finds herself changing even more. She was used to fighting, respected those who fought well, and she hated anything magic. Miach called himself a simple farmer. She was uncertain he could fight, plus he seemed to have a little use of magic. But this was becoming a treacherous journey they were undertaking, and Morgan soon found herself accepting the additional help. 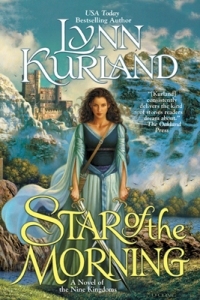 Star of the Morning is the first in the Nine Kingdoms epic fantasy romance trilogy. We begin with the discovery of the erosion of the protections, and the search to find a sword wielder. In this search, Miach comes to find a woman who he fears might be the person they are searching for. It is not that he doesn't trust her, in fact, her fighting skills are among the best there are. However, Miach fears that once she learns of his betrayal, that he isn't a mere farmer with little magic, he was in fact, a mage of most significant abilities, any feelings of fondness she might start having towards him will disappear. I adore Miach. He is such a gentle soul, which is appropriate considering the amount of power he can wield. He doesn't search to abuse his abilities, he simply wants to live in peace. However, he is not afraid of fighting when necessary. Morgan, however, prefers fighting to anything. She uses that aggressive behavior as a protective barrier. I loved watching Miach as he slowly, calmly, erodes that barrier to find the woman within. Star of the Morning is Lord of the Rings romance style. There are mages, evil and good, kingdoms, great legends, and an epic journey of friends and strangers. Yet the developing romance between Miach and Morgan is the heart of the trilogy. There is a cliffhanger at the end of the story, which leads directly to the second book of the trilogy.